"...A curio-shop intimacy and cash bar encourage audience participation, and Watkins, with his Eagle Scout looks, clearly takes a mischievous pleasure in the unexpected. Just let your cell phone go off during the show and see what kind of fun he has." "..If 500 people see you put a body in a box and saw it in half with a sword," Watkins' mentors cautioned him, "they assume that-well, it's a special kind of box." Heeding their advice, Watkins is more inclined to focus his attention on, say, asking playgoers to write their names on a scrap of paper, which he then shreds and makes whole again in full view of the authors. This minimalist approach is what continues to draw overflow crowds of downtown guests and staycationers alike, all eager for an opportunity to share in 90 minutes of dazzling risk-free sorcery with their host's assurance that the key to the miracles occurring barely arms' length away lies solely in their own imaginations." "...Maybe miracles is too loaded a term for misdirection (Watkins also calls it "unearthly feats of physical skill"). But grandpa got the intimacy argument permanently right. And, fittingly, grandson pulls off his feats in a brightly lit room, his every act open for inspection, however impossible to explain away. A skilled card counter (he could ravage a Vegas casino) and reader of spectators' "tells" and "reveals," Watkins argues that it's the audience who are the true magicians-by believing in the first (and last) place and also by projecting their thoughts so he can "read" them out loud. (No fooling: He asks them to project the very words over his head so he can get them.)" "...Do you believe in magic? I am always amazed and astounded when I watch a true magician do his (or her) thing. My ten year old grandson has become fascinated with the art of magic and so when I saw an opportunity to take him to see Chicago's own Dennis Watkins do his special show "The Magic Parlour" at the Palmer House Hotel in the loop. How fitting that this magician learned from his grandfather, making him a third generation magician, would be performing the things he learned from his grandfather for me and my grandson." "...Luckily Watkins, a charming performer, manages both, keeping the audience fully engaged by involving a number of volunteers and insisting that everyone treat the space as their own "parlor"-rising or moving to get a better view of any bit they can't see and getting additional drinks (included in the price of the ticket) when they feel the need." "...Because he’s so talented, Watkins’ doesn’t need to employ a lot of fuss in order to wow the crowd. There aren’t major special effects or smoke and mirrors. It’s simply him on stage delivering his talent simply and wonderfully. Come enjoy 60-minutes of pure magic and laughter!" "...It's clear that The Magic Parlour appeals to tourists staying downtown, but The House Theatre's long-running event should please both casual fans and magic aficionados alike. Dennis Watkins is the perfect host, and the evening features endless shocks and surprises that will leave you permanently stunned. 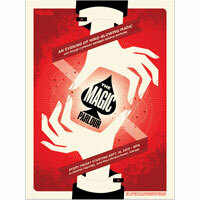 The Magic Parlour is a bewitching theatrical escape that will make you feel like a kid again." "...Watkins has mastered every element of magic to give us a flawless performance. Nothing seems to throw him for a loop and he improvises like the best of them. His joy is infectious as he laughs and jokes with the audience. And the audience loves him right back, laughing at his jokes and mouths dropping in pure awe."